This fruits of the forest honey is deeply coloured and flavoured honey, rich with the fragrances of Italian woods. This is a honey to savour in yoghurt, over ricotta cheese or on buttered toast. 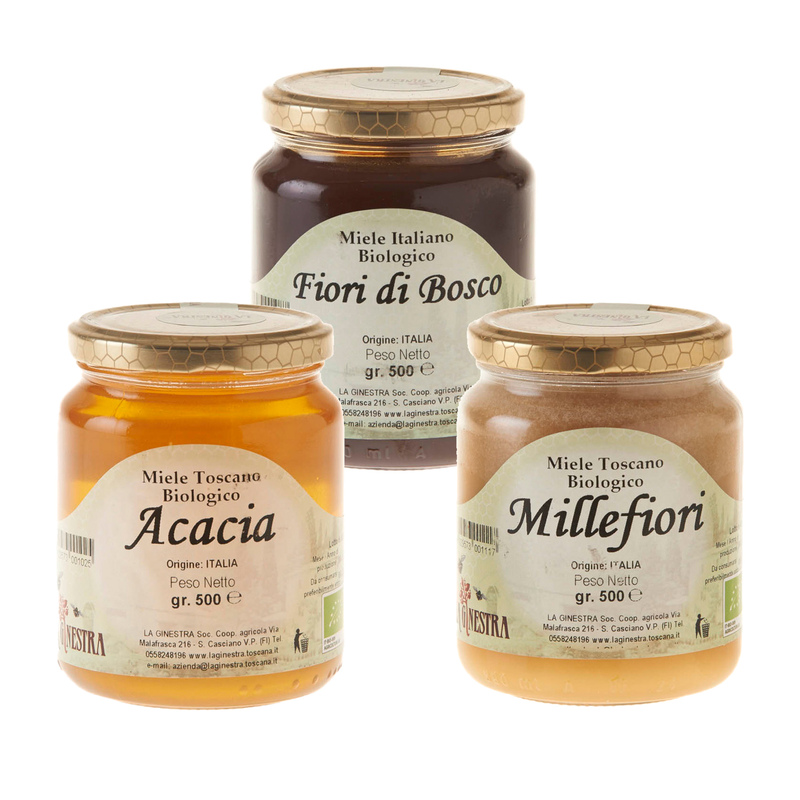 Mille fiori in Italian means ‘thousand flowers’ and the bees that made this honey pollinated in a region where there were many varieties of flowers giving its complex floral taste. Mille fiori is also often called wildflower honey. This is one of the better known and loved table honeys and also in some ways the rarest: made of nectars from flowers in a particular place at a particular time, it is essentially impossible to reproduce its unique colour, aroma and flavours from year to year. This is the perfect honey for every use; dark, thick, crystalized with a rich sweet finish. It is a high energy food, perfect spread on buttered toast for breakfast and delicious with most cheeses. Acacia honey is very pale with a sweet, delicate floral flavour and therefore one of the most popular honey varieties. It is a good choice for mixing with drinks because it will sweeten them without changing the taste of the drink. It is also a great choice for cooking because of its mild flavour and because it mixes very easily. Acacia honey is slow to crystallize, this means that it can remain in a liquid state for a long period of time due to its high concentration of fructose.